"If it is not right do not do it; if it is not true do not say it"
Marcus Aurelius - one of the five good Roman Emperors. One of the most important Stoic philosophers. Taught in his early years by Emperor Hadrian. The recent poor weather has put the construction of the path in the Jurassic garden on hold but there are always other jobs waiting. The first job was to remove much of the dead pond weed and claim back some open water in the pond for the pond skaters and water boatmen to thrive in. Four barrow loads were removed. The weed though was left at the side of the pond for 24 hours to enable any invertebrates in the weed to hop or crawl back into the pond. Open water has returned to the pond! There is a little more work to be done yet to complete the task. The second phase will be to tidy up the vegetation alongside the pond. Although spectacular at present if not checked it will become too dominant. Another job which was started was the removal of the large viburnum bush by the machine shed. This had got out of hand and was blocking light from one of our paper bark birch trees causing the growth to slow considerably and forcing the tree away towards what light it could find. The branches have been removed and the stump will be dug out in due course. It will of course open up a small new area of the garden for another project! The grass bed in the Memory garden continues to be improved on ready for 2015. With the old dogwood gone a new open area has been created and a wide range of grass species has been planted to reveal texture and form. The recent addition has been of a couple of Gaura -whirling butterfly- plants. Their lofty flowering stems will compliment the grasses and bring a little more interest. The plants originate from North America but are favoured by bees and other insects. The range of grasses have been chosen to provide, hopefully, all year round interest. Some will reach 2.4m tall- we hope! Many animals are found in the garden which are always trying to eat whatever we grow. Woodpigeons and Grey Squirrels are the largest and most obvious we come across but early the other evening a snail was caught red handed helping itself to a tomato. Its' neck was at full stretch! 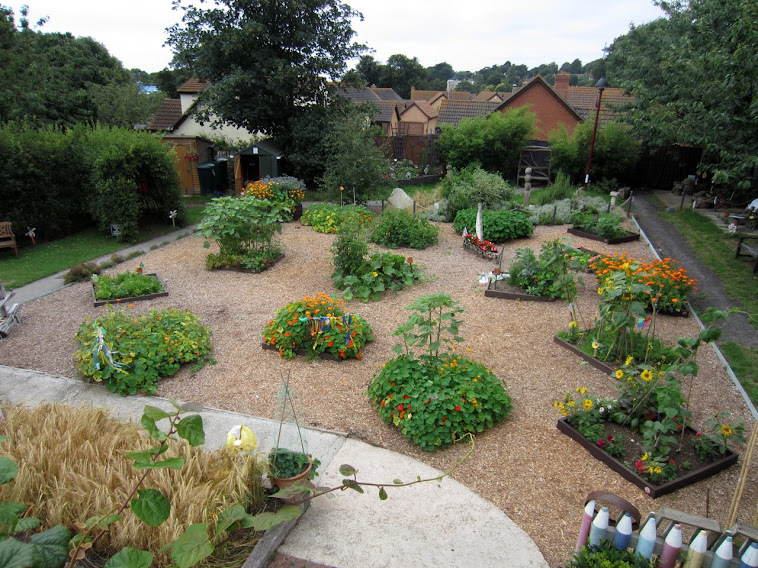 With school restarting very shortly and an influx of new pupils we hope they will enjoy the garden and help make a contribution to it as have other children over the past years.